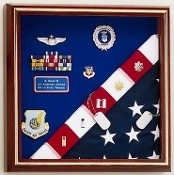 Flag Display Cases and the Best Flag Case from Flags Connections Flag Cases, Flag Display Cases and the best Flag Case are available online from the finest company on the planet, Flags Connections, and if you want to order Flag Cases, Flag Display Cases or a Flag Case for your father, husband, brother, sister or aunt, Flags Connections is the only company on the internet that you need to consider. 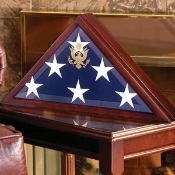 Large Flag Cases from Flags Connections are proudly made in the USA and come in a variety of different materials like rich mahogany or oak. 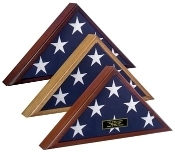 Buy a flag case from Flags Connections that not only holds a burial flag, but medals and certificates as well. 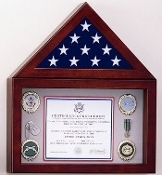 Flag Display Cases like the flag case for two flags can hold 3x5” flags and is perfect for hanging on the wall of an office, den, or living room. Handcrafted by a veteran in the United States, it is available in cherry wood, oak, and walnut or with a cherry finish. 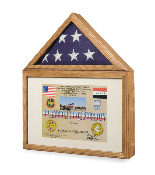 The two flag display case is available in three sizes and can even hold a burial flag. If you have been shopping for Flag Cases online, your search is over. 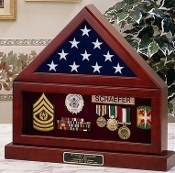 Flag Display Cases, Flag Cases, and that special Flag Case for a member of the military are usually shipped within 24 hours of order placement. You can shop with Flags Connections 24 hours a day 7 days a week from the comfort of your home or office. 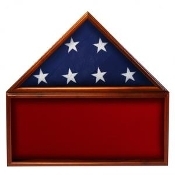 There is nothing more convenient than buying flag display cases, flag cases and that custom-made flag case from Flags Connections. 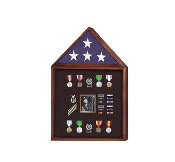 The Octagon Military Shadow Box is 23” by 23” and provides enough space for a flag, medals, certificates photo’s and military memorabilia. 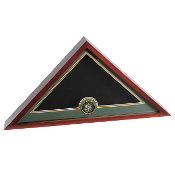 The Octagon Military Shadow Box is a wonderful example of the flag cases available from Flags Connections and is available in cherry, red oak or walnut. You can also choose a black, red, blue, or green background. 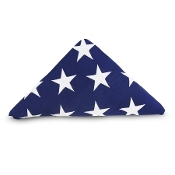 Order a personalized Flag Case from Flags Connections and surprise the veteran in your family. 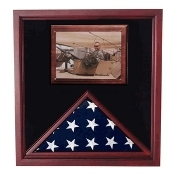 If your son or daughter has been recently deployed personalized Flag Cases make the perfect gift. 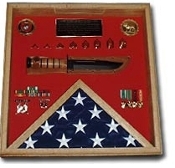 The Deluxe Combo Awards Flag Display Case from Flags Connections is another beautiful example of the fine workmanship only available from Flags Connections. 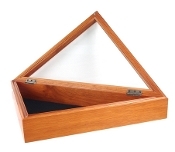 Measuring 27” wide by 21” high and 3” deep, the Deluxe Combo Awards Flag Display Case is available for all branches of the service and comes in solid oak or walnut. Featuring a glass front with a laminate panel on the back with a hanger, this stunning Flag Case also has a crushed velvet background. 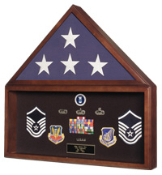 Shop now for the best Flag Cases, and Flag Display Cases only available from Flags Connections.